James meets Xenia in Grand Hotel Europe. 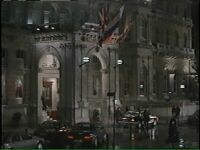 In the movie the façade of the building is adorned with flags of Great Britain, Russia, and USA. 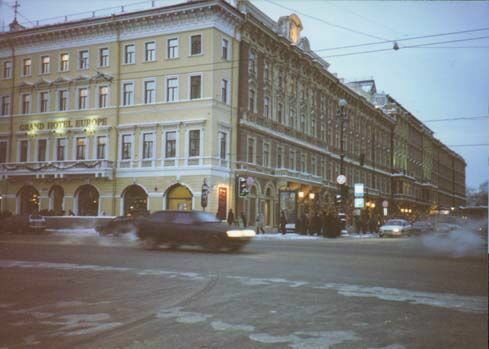 In reality, Grand Hotel Europe is conveniently located on Nevsky Avenue, close to the usual tourist attractions but far from the usual path tanks take in the city. 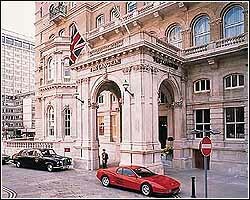 It's one of the best hotels in the city, although it remains unclear whether it can offer its guests a pool and a steam room. That's what the real Grand Hotel Europe looks like. There is neither a huge columned porch nor a room to add one. 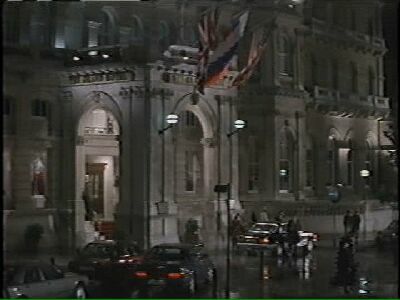 The façade we see in the movie belongs to Langham Hilton in London, which was for one night transformed into a Russian hotel. An attentive eye will notice they didn't even bother to remove a traffic sign. Why, indeed? In Russia they look just the same.